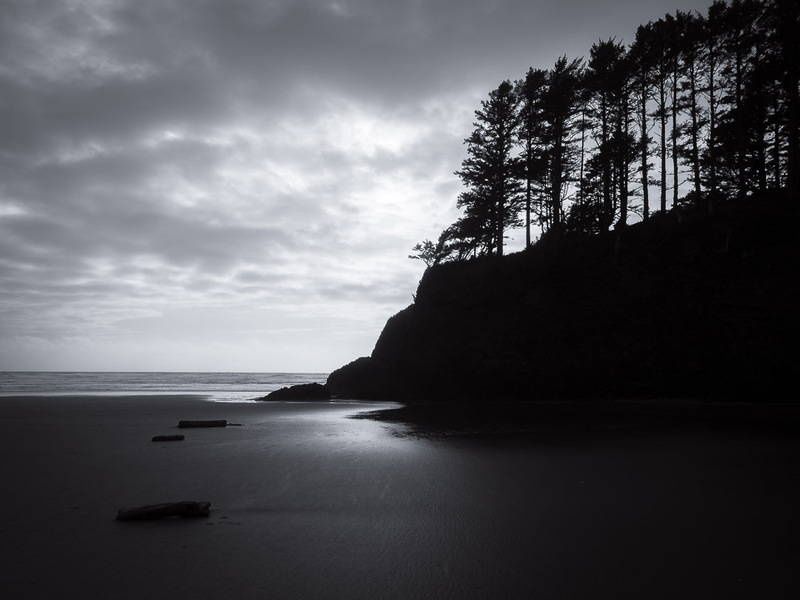 During last weekend’s trip to the Oregon Coast I took some photographs that due to the high contrasts within the composition, I thought would look good converted to monochrome. When shooting with B&W already on my mind, I typically set my camera to a monochrome preset (most modern cameras have that feature). So when composing, I’m looking already at a monochrome image in my viewfinder or on my LCD screen. This helps me judging the impact of light and contrast before pressing the shutter. Maybe this is not the right approach for a purist, but I gladly take this as a great supportive feature of modern cameras and is as helped me discover the fun in B&W photography. For more monochrome coastal images and some more thoughts around it continue reading after the jump…. As already mentioned, I set my Olympus cameras to a high contrast monochrome preset when having the intention of shooting B&W photography. Especially on the retro-styled PEN-F this is quite easy, as you have a dedicated dial on the front (this used to be the ISO dial on the original PEN from the 60’s) that makes this (and other presets) available at a slight twist of the fingers. Still I make sure I capture the image in both jpg and RAW. The jpg records the photo with the applied preset as seen in the viewfinder. As you surely know, the RAW records the full color information of the image, but most important, it captures much more tonal range and details than a jpg and this gives you much more to play with in the digital darkroom. A RAW file always needs to be processed, as it does not apply any in-camera processing (like sharpening, adding saturation etc.) like a jpg does. Sometimes, I use the black and white jpg directly out of camera, without any post processing, but more often than not I do the actual conversion to monochrome with the RAW file. The higher tonal range captured in RAW makes a difference once you get in the finer details of post processing like adjusting graduation curves, which I do with almost all my RAW conversions. I do all of my monochrome conversions in Adobe Lightroom CC. As a starting point I have collected some presets over the years, some from other photographers, some I came up myself. I have a standard set of 10 monochrome presets that I work with as starting point, before I just overall exposure, contrast, setting of the correct black and white points and then adjusting the graduation curves until I’m satisfied with the results and it replicated what I saw on location, converted to black and white. Rarely I introduce some grain, mimicking old analogue B&W films. More often than not I add a slight vignette. I’m aware this is not everyone’s taste, but at the end my processed images need to satisfy only me myself. If anyone else likes them as well, that’s a bonus. The photos above where taken with my Olympus PEN-F and the mZuiko 12-40mm F/2.8 Pro Zoom. The shot below was with the Olympus OM-D E-M1 with the mZuiko 40-150mm F/2.8 Pro Zoom. 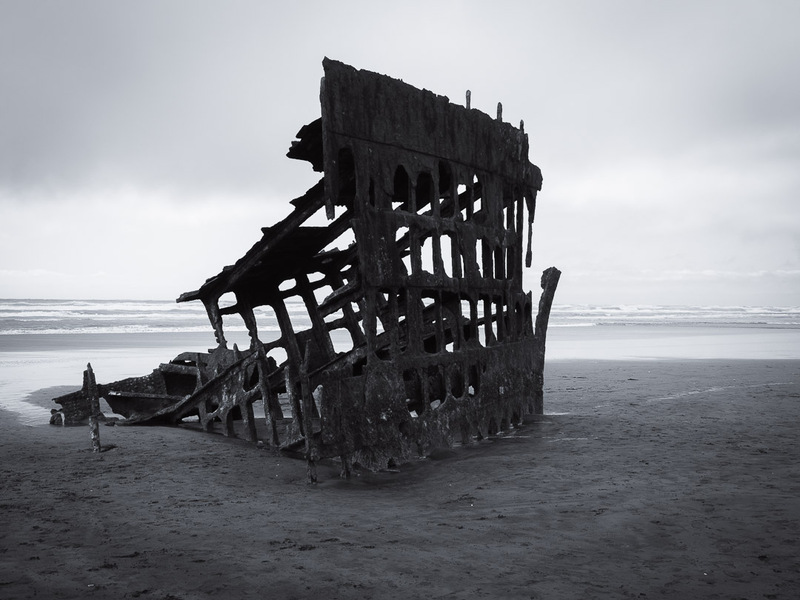 The shipwreck in the introductory image is the “Peter Iredale”, a four mast iron sailing ship that ran aground in 1906 near the mouth of the Columbia River and lies on a beach at Fort Stevens State Park near Astoria. 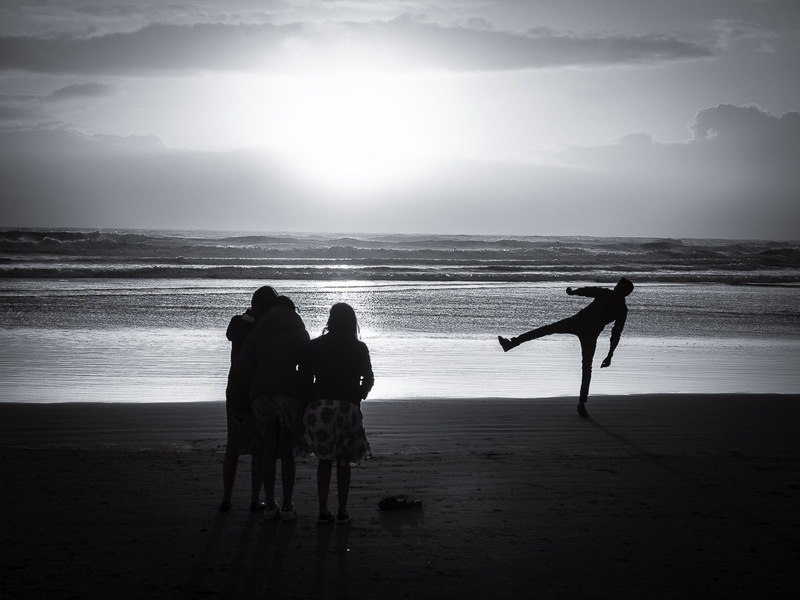 The other photos were taken at Cannon Beach, Oregon. Let me know your thoughts about monochrome shooting in the comment section. 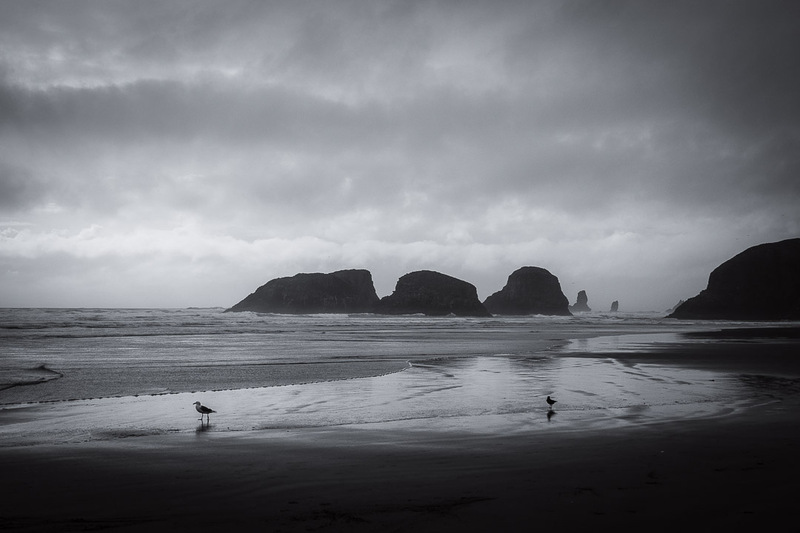 Hi Marcus – I just ran across these images from the Oregon coast in B&W. I convert a ton of my images to B&W. As a photojournalist for over 40 years I see images that way. I shoot everything in raw and then convert using Silver Efex Pro from Nik software (Google) they are now discontinuing it. Over the years I have found that converting this way gives me what I want fairly quickly. I then will mess around with it a bit more in LR CC. Two years ago we were at Cannon Beach and will be stopping by there on our way down to Coos Bay this year. Thanks so much for sharing your thoughts and experiences, Kirk! I’m sure that, doing photography professionally for 40+ years, you visualize in a complete different way than I do. I really started B&W only after switching from Nikon to Olympus m4/3 using monochrome live view which my Nikon couldn’t do. I started converting with Nik Silver Efex Pro as well, but since upgrading to LR CC I use my own fine-tuned presets as starting point for a quick conversion of the RAWs I shoot. Cannon Beach is awesome, there is so much to see and shoot. I prefer the more quiet northern part of the beach. Haven’t been to Coos Bay yet, but it is on my list! Thank you for sharing your perspective on the editing process. I have to admit, while my camera can shoot in RAW, it’s a little overwhelming to know what to do with them and how to edit after! Thank you. You have challenged me to consider tuning out the color and tuning into all the elements that really make photography a science as well as an art. This is what B&W is all about, reduction to form and contrast. Glad if I made you consider to change your approach! I rarely produce color and in most cases I almost, “see” in b&w when I shoot. Great work! Thanks, Nora, most appreciated! I try to see in B&W, but it really takes a lot of practice! Always love the drama and contrast of monochrome. Great reminder and great choice for stormy skies as well. No worries! I have been preoccupied myself. Life happens! 😁❤ enjoy your weekend! Danke 🙂 ! Und dir einen Happy Mayday! Wow, brilliant photos. Just noticed about a week ago my camera has a B/W function so have started using it a bit more where I think it may be appropriate. Also noticed something called RAW but didn’t know what it was, so left it alone. Unfortunately I don’t have the stuff to do post processing, so sometimes do basic my computer will allow. Will make a note of all that and do some research. Cheers. I also use the black & white preset in camera…teaching myself to be more open to light and shadows. Personally I like the atmosphere it seems to have over colour but also the added creativity and expression …. These are very nice. Makes me think perhaps I should try this sometime. Thanks for the tips. That’s a good idea to shoot monochrome in camera and then adjust the RAW in post processing. Thanks! And I feel the same way about vignetting. I think it adds a subtle focus to the subject in the image. Great if you find it helpful. 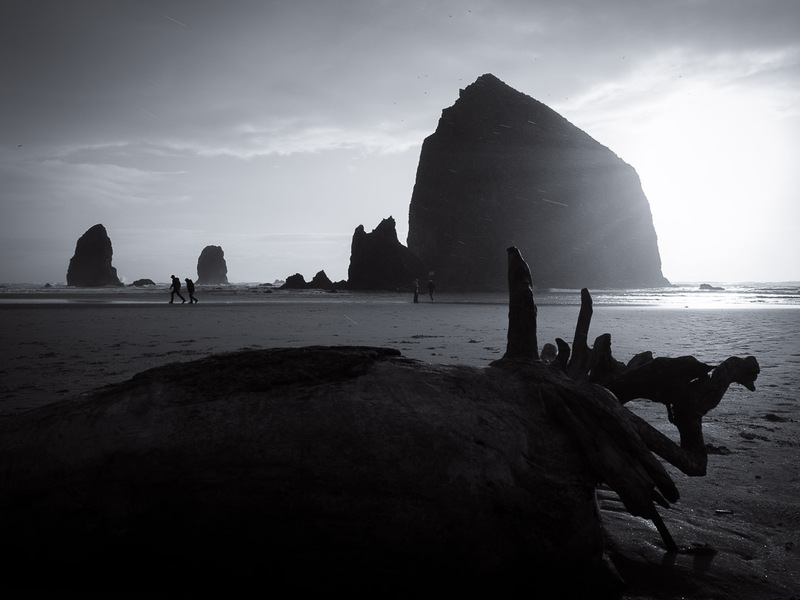 Cannon Beach has so much to offer in terms of black & white photography! Great advice on setting the b&w preset in camera.